Massachusetts trees are a thing of beauty; at least until they interrupt your plumbing. The beautiful trees throughout Massachusetts serve many purposes. They provide natural wind breaks, offer cooling shade and add beauty to your landscape. But they have a not-so-secret system at work underground that can secretly wreak havoc on your plumbing. Tree roots branch out incredibly far from the base of the trunk. For some larger, older trees, you might find roots halfway across your yard. They’re determined, too. They grow year after year. And they’re so strong, they can break clean through asphalt, concrete, and your home’s sewer line. If you have slow-moving drains or notice an unpleasant-smelling area outside the home where the ground often feels damp, the roots from a tree might be the cause. The tree doesn’t have to be planted anywhere near the line. If there’s a tree (even a smaller one) in your yard or on neighboring property, it’s worth checking out. There’s a longstanding belief that the size of the tree branch canopy is a good indicator of the root structure. That’s not really true. Tree roots can and do extend much farther than that. What’s more, the majority of the root system is near the top 2 feet of soil. According to the Morton Arboretum, tree roots often extend 2-3 times wider than the branch canopy above. And you’ll find more within upper 18 to 24 inches of soil than deeper down. Unfortunately, sewer lines sometimes share the same space. In some cases, a bit of digging is required to find and treat the problem. Tree roots can naturally grow through a sewer line, causing a break or completely obliterating it. The sewer line might be in the natural path that the root wants to grow. Or the root might grow toward a sewer line that’s already leaky because it’s looking for moisture. After all, providing moisture to the tree is a large part of the root’s job. Either way, roots are a major problem when they come in contact with your plumbing. 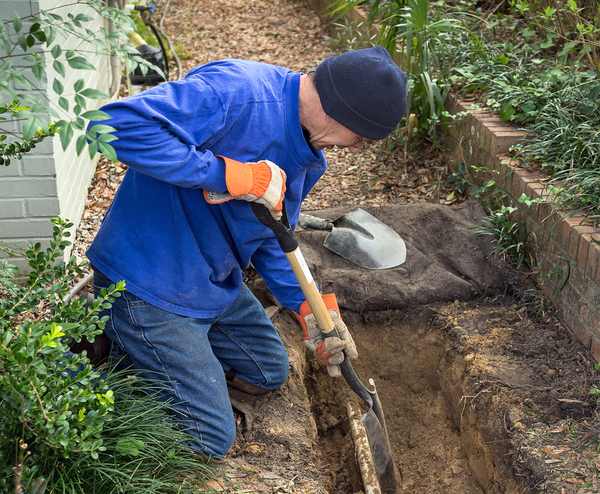 Roots will push straight through sewer lines made of clay and other materials, and what you’ll be left with is a mess that requires some excavation and repair. It’s never a happy day when you find out that a tree root has broken through a sewer line. They’re not the cleanest part of your plumbing system. And if yours are clay, as many older homes have, they’re inherently leaky. To make a repair, the plumber must first access the line. That often requires digging. Fortunately, it’s not as enormous a problem as it might seem. Plumbing is a relatively straightforward operation, even under the worst of circumstances. We’ll assess the situation, determine whether a root is the cause of your problem and then set about making it right. The old line may be repaired, although this is relatively rare. More likely, the section will be replaced. There’s also a chemical treatment that can kill nearby creeping roots before they make it into the line again. In some cases, an auger is used to grind out the offending root to keep the plumbing system flowing. Massachusetts homeowners who have a recurring tree root problem might want to reconsider the vegetation on the property. Trees are lovely and they benefit the environment. But they can also be the source of a lot of headaches if the roots refuse to grow away from the sewer line. Call Rodenhiser today if you live in the in the Route 495 / 128 area and have slow-running drains or suspect that a tree root has made its way through your sewer line. Problems such as these don’t correct themselves. They only worsen over time. But we can find the real cause, make the repair and get your plumbing in good working order again. Don’t wait until you need a life raft. You wouldn’t let a leaky plumbing supply line at the kitchen sink send water throughout the room unchecked. But leaks can be sneaky things that don’t show their true nature until a much greater damage is done. Every leak should be stopped in its tracks ASAP. Even a minor one can cause major headaches. And the longer they go without repair, the more expensive and damaging they become. Here are 3 reasons why leaks in your home should always take top priority. A dripping drain under the bathroom sink makes itself known pretty quickly. But what about a supply line inside the wall or under a toilet? By the time you know that there’s a problem, the damage can be widespread. That’s one of the biggest reasons why a known leak should never go without repair. A damp spot on the ceiling might look like a tiny problem that can wait. But in reality, it takes a lot of water to leak through the upstairs bathroom floor and then on through the ceiling below. The leak might be small but persistent. Or you might have a major leak under the toilet, shower or sink. Even the small indicators of water need attention. That’s especially true if the damp spot never really dries. Some leaks really are minor. They can cause a quarter-size stain on the ceiling or along a baseboard but require only a small repair. But you won’t know until it’s checked out. A larger leak can lead to mind-boggling problems. Mold is a major issue with a longstanding leak. There might be a few specks on the drywall, but a huge colony of spores behind it. Structural damage is another possibility. Interior wood isn’t treated to resist water. So where damp conditions persist, you might require significant structural repair. In some cases, whole floors require replacement because the entire subsystem is rotted. A spongy floor is a bad sign that water damage has gone too far. Water and electricity don’t mix, at least not with a happy ending. But leaks can cause electrical problems and even electrocution. When a spot appears on a wall or ceiling, just remember its proximity to ceiling and wall electrical fixtures. Don’t wait to make that call. The sooner you call, the better off you and your home will be. In addition to the physical damage to your home, leaky plumbing wastes precious natural resources and drains your bank account. They say that small leaks sink ships. That’s because it all adds up over time. And the longer a leak is allowed to exist, the more water and money you lose. How much? You might be surprised. According to the EPA, a faucet that drips at a rate of one drop per second wastes 3,000 gallons per year. Now imagine a leak that drips at the same rate inside a wall that’s gone unchecked for a month. That’s 250 gallons of water that’s been added to an area where it was never meant to be. Fortunately, you know a plumber who can find and fix leaks before they cause major headaches. Rodenhiser has helped Massachusetts families in and around the Route 495 / 128 area since 1928. We’ve got the skills and experience to correct every problem and keep your home safe and healthy. 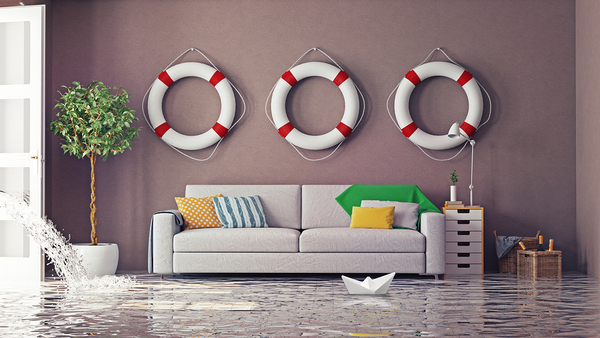 Don’t let a plumbing leak continue to damage your home and put your health at risk. Call Rodenhiser today. He’s only cute if he’s outside. As if a plumbing leak wasn’t bad enough on its own, now look what it has attracted. Living things of all shapes and sizes mainly have one thing in common, and that’s the need for water. Some creatures, such as humans, puppies, tigers, and bears, need a lot of it. And some, such as mice and insects, only need a little. Unfortunately, a plumbing leak might leave just enough water to attract all sorts of invasive varmints. You might not find a bear in your kitchen when you flip on the light, but you might have a similar reaction to cockroaches scurrying across the floor. When that happens, the only way to keep them out for good is to locate and stop the leak. Virtually anywhere you have drain and water supply lines, you have the potential for a leak. Some lines run under floors, some are found inside walls, and some run through the ceiling. 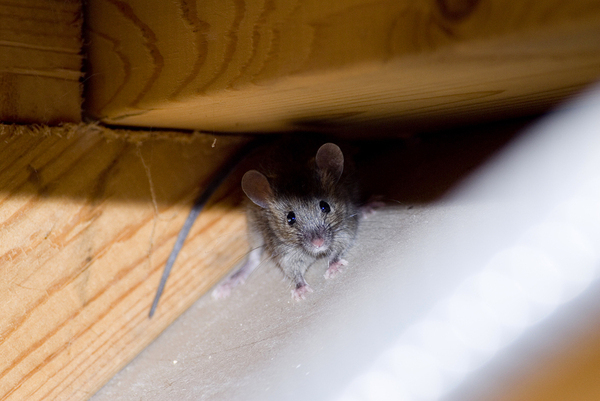 If you see a rodent or insect, think about whether there’s a water supply close by. Sometimes it’s obvious. If a cockroach runs under your kitchen sink cabinet, there’s a good chance that a leak in the sink drain line or one of the water supply lines is the culprit. It could also be a leaky disposal or dishwasher. Sometimes you can’t find the source, but a plumber can. 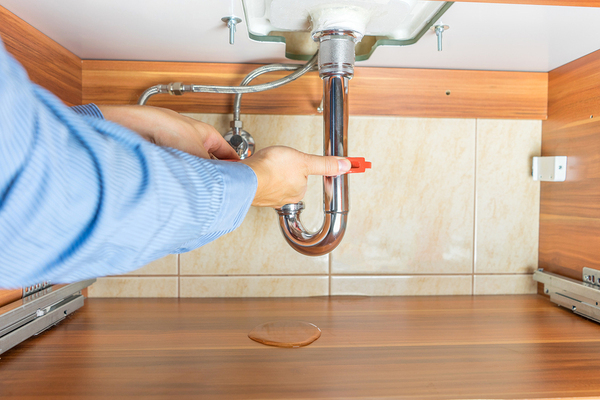 If the leak is under the floor, around the bathtub or behind your washing machine, a bit of investigation on the part of your plumber will suss it out. The E.P.A.‘s Marcia Anderson says that the presence of rust on any fixture is a good clue that there is a water problem. Some spots are famous for water leaks. Don’t be fooled by the notion that a leak means a major pool of water. Because insects and rodents are so small, it doesn’t take much to make them happy and comfortable setting up housekeeping inside your home. Your leak might only amount to a few drops a day. It might not even pool, but soak into the subfloor or drywall. As long as the dampness is relatively consistent, critters will know where they can wet their whistle. Kitchens are a special problem because of the amount of plumbing plus the smorgasbord of crumbs. When you consider ample water plus the available food source underneath the kitchen stove deck or under the fridge, you might as well have hung out the welcome sign. With warm weather upon us, it’s more important than ever to find and repair plumbing leaks. Insects and rodents thrive in spring and summer, multiplying at a rate that might boggle your mind. They all need water, and your home is a great source for it. Then when fall arrives, whole colonies may have established themselves as permanent residents. But you can issue their eviction papers by calling Rodenhiser plumbing experts. We know where to look for pesky water leaks, and we can repair them to make your home less inviting to pests. Contact us today for plumbing repair that seals leaks permanently. 5 Plumbing Problems That Start Out Small, Then… Watch Out! When you see or suspect a problem, a pro can find it and protect your home from further damage. Plumbing problems can mount up in unexpected ways and cost you a great deal of money, at least if they’re left unattended. Some issues are clear, but might seem mostly harmless. Some hide until the damage is extensive, leaving you with a major repair on your hands. Either way, plumbing that doesn’t work like it should needs attention. If something seems like it’s not quite right, listen to your instincts. 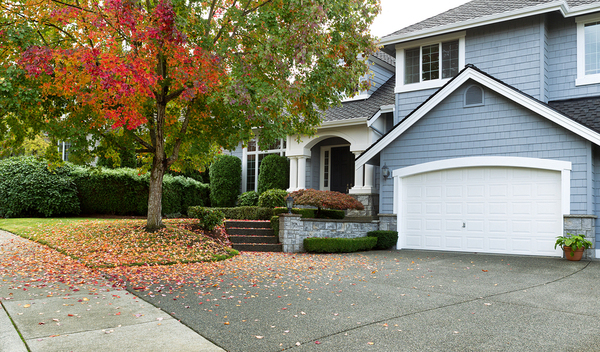 Here are five issues that seem small but could cost you dearly. If you’ve dealt with the drip-drip-drip of a leaky faucet, you know how frustrating it can be. Maybe you’ve attempted a bit of DIY repair, only to have the drip return just as you’re trying to drift off to sleep. If the drip is in the bathtub, the sound can be even louder. But what you might not realize, at least not yet, is how much a dripping faucet can cost. According to the U.S. Department of the Interior, a single dripping faucet can add up to 34 gallons of wasted water per year. And that’s if it’s a slow drip. If the tap leaks around the base instead of a drip from the spout, it’s impossible for you to calculate how much water is lost every day. Did we mention that a leaking faucet can slowly erode porcelain or acrylic from a sink or tub? Low water pressure takes all of the joy out of a long, hot shower. It makes filling up the washing machine and bathtub a bit of a challenge, too. And forget about washing the car or hosing off the walkway or front porch. But this problem might be more than a nuisance, and the issue could lie inside your home instead of with the city’s service. Older water supply lines made of galvanized steel develop corrosion inside over time. That corrosion builds up where you can’t see it, which restricts the flow of water. If your home has galvanized supply lines, the problem can only worsen. Replacement with new lines will restore the water pressure and make your morning shower a lot nicer. Nearly every home has a slow drain once in a while. But if your slow drains are more of a chronic problem, the culprit is probably more than a small blockage. Drain openers and plungers can only do so much to help if the problem is something bigger. And you should never use drain opener to help a slow toilet. You’ll end up with a cracked bowl for your trouble. Tree roots can inch over and ultimately break then infiltrate the sanitary sewer lines buried in the ground. Another possible problem is a plumbing vent. All homes need vents, which help water flow through the lines effortlessly. But if your vents are inadequate or blocked from leaves or a bird’s nest, you could spend an inordinate amount of money and time trying to open a clogged drain that’s not really clogged. 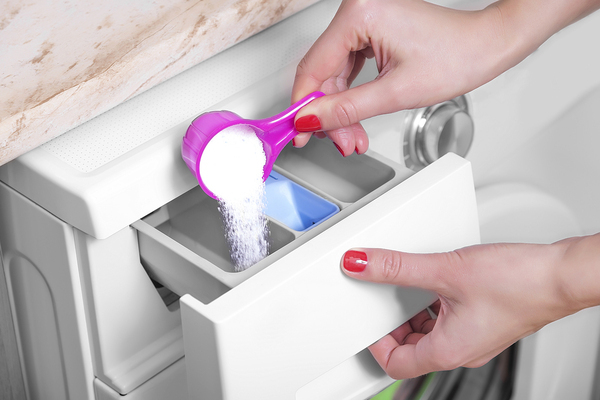 Catch it in time, and your expensive cabinetry will stay intact. A small puddle of water under the kitchen sink or beneath the toilet tank means you need repair service. But some homeowners make do with an old towel to catch the drips. The problem with that approach is the towel stays wet. And where there’s water, there’s the potential of widespread damage. A chronically wet floor won’t stay sound for long, especially around the base of a toilet. Moisture eventually seeps into the subfloor under the base of the toilet or through the opening for the water supply line. When that happens, warping and wood rot isn’t far behind. The same applies to a wet cabinet floor under the sink. And where there’s water, there’s also mold. Are you paying more for water service lately? If you haven’t experienced a rate increase and your habits are the same as they’ve always been, you could have a significant problem lurking someplace in, under or around your home. Hidden leaks can cause widespread damage and cost a fortune in water bills, plumbing service and even structural repair. By the time you see evidence of a leak, the damage might be done. A soggy spot in the yard is an indicator that a supply line has burst underground. Soft floors in the bathroom, mold along the base of the wall and yellowish spots on the ceiling are clues that you have a leak inside a wall, ceiling or floor, depending on where your supply lines run. Plumbing doesn’t seem like a dangerous problem, so some homeowners deal with annoyances and high bills much longer than they should. After all, water won’t cause you physical injury if something goes wrong. Unfortunately, plumbing issues can multiply, sometimes unseen, until they’ve done considerable damage. If you’ve noticed a leak or something seems not quite right, Rodenhiser Plumbing, Heating and Air Conditioning can make it right. Contact us today before your little annoyance becomes a major problem. Preventive maintenance is essential for lengthening the life of your heating and cooling system and keeping it running efficiently. 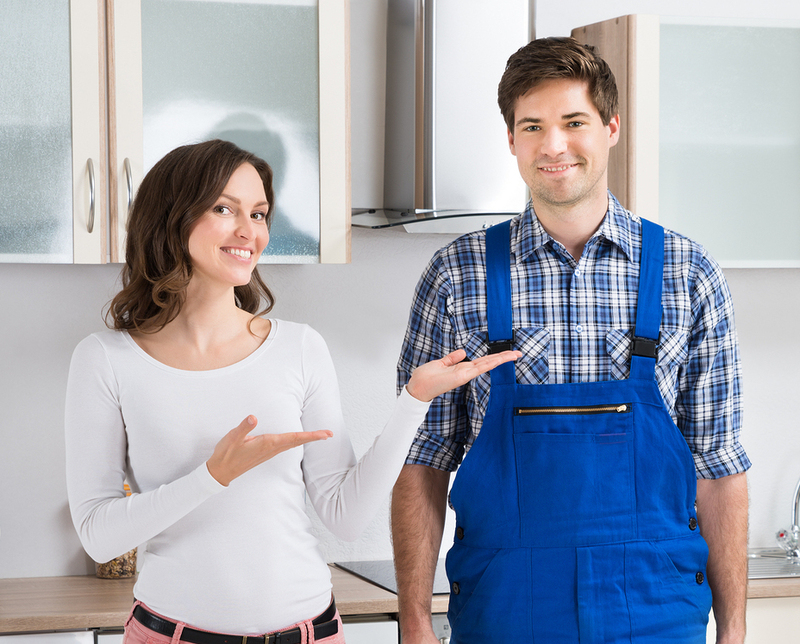 Just like with major repairs and equipment installations, you want to work with somebody you trust to handle your valuable home comfort equipment. Why Choose an EPA-Certified Lead-Safe Firm?